Seed dormancy is an adaptive trait preventing premature germination out of season. In a previous report (Piskurewicz et al., 2016) we showed that dormancy levels are maternally inherited through the preferential maternal allele expression in the seed endosperm of ALLANTOINASE (ALN), a negative regulator of dormancy. Here we show that suppression of ALN paternal allele expression is imposed by non-canonical RNA-directed DNA methylation (RdDM) of the paternal ALN allele promoter. Dormancy levels are further enhanced by cold during seed development. We show that DNA methylation of the ALN promoter is stimulated by cold in a tissue-specific manner through non-canonical RdDM, involving RDR6 and AGO6. This leads to suppression of ALN expression and further promotion of seed dormancy. 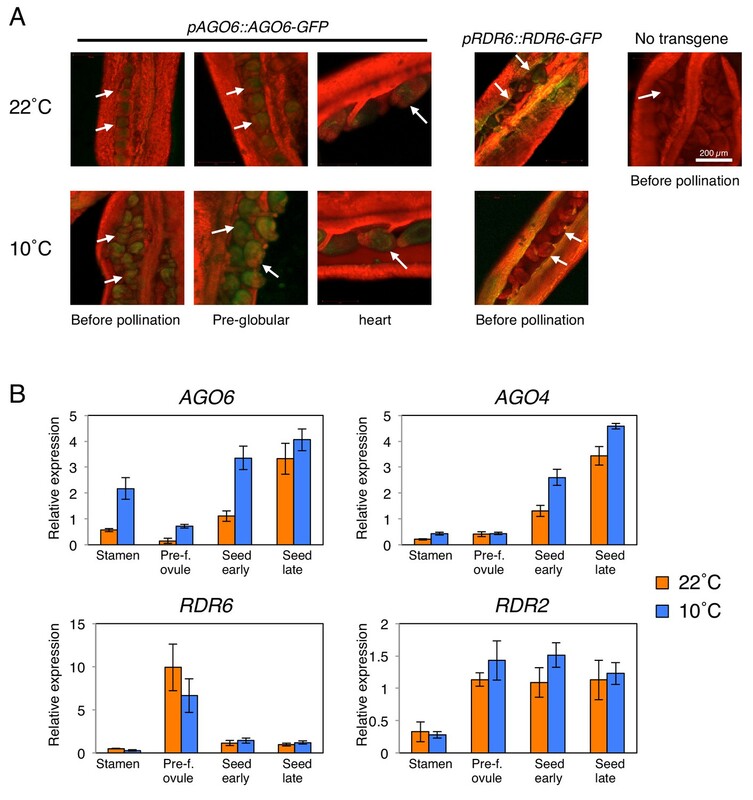 Our results suggest that tissue-specific and cold-induced RdDM is superimposed to parental allele imprints to deposit in the seed progeny a transient memory of environmental conditions experienced by the mother plant. Newly produced seeds exhibit dormancy, a trait whereby germination is blocked upon imbibition under otherwise favorable germination conditions. Dormancy prevents germination out of season and facilitates final dispersion of the plant embryo. The Arabidopsis seed consists of an embryo surrounded by a single cell layer of endosperm and an external seed coat. The endosperm is essential to repress dormant seed germination by releasing the phytohormone abscisic acid (ABA), which blocks embryonic growth (Lee et al., 2010; Chahtane et al., 2017). Dry seeds gradually lose dormancy over a period of time, referred as ‘after-ripening’, thus acquiring the capacity to germinate. After-ripening time is therefore a measure of dormancy levels, which vary across Arabidopsis accessions. In a previous report, we observed that hybrid seeds arising from reciprocal crosses between high and low dormancy accessions could inherit dormancy levels more akin to the maternal ecotype. We identified a set of genes exhibiting preferential maternal allele expression (genomic imprinting) in the endosperm of dormant seeds, which included seed germination regulators (Piskurewicz et al., 2016). We showed that maternal inheritance of dormancy levels is implemented through the preferential maternal allele endosperm expression of ALLANTOINASE (ALN), a negative regulator of seed dormancy. We also reported that cold temperatures during seed development, which markedly increases dormancy levels in Arabidopsis seeds (Donohue et al., 2008; Penfield and MacGregor, 2017), suppressed the expression of numerous maternally expressed genes (MEGs), including ALN, upon seed imbibition (Piskurewicz et al., 2016). Genomic imprinting requires ‘imprints’ distinguishing parental alleles. In Arabidopsis, DNA methylation serves as a primary imprint for numerous MEGs (Rodrigues and Zilberman, 2015). The DNA demethylase DEMETER (DME) removes methylated cytosines at specific loci of the central cell maternal genome, resulting, after fertilization, in different DNA methylation levels between maternal and paternal genomes (Choi et al., 2002; Choi et al., 2004; Gehring et al., 2006; Morales-Ruiz et al., 2006). DNA METHYLTRANSFERASE 1 (MET1) is also required for imprinting by maintaining paternal allele CG methylation during DNA replication (Jullien, 2006). In addition to this mechanism, canonical RNA-directed DNA methylation (RdDM) can contribute to paternal allele silencing in some imprinted genes (Vu et al., 2013). Canonical RdDM involves RNA polymerase IV and V (Pol IV, Pol V). Pol IV-dependent RNA transcripts are transcribed by RNA-dependent RNA polymerase 2 (RDR2) to produce double-stranded RNAs (dsRNAs). dsRNAs are cleaved by DICER-LIKE 3 (DCL3) into 24-nt small interfering RNAs (siRNAs, which are then loaded into ARGONAUTE 4 (AGO4). The transcripts emerging from Pol V are recognized by siRNAs bound to AGO4 through sequence complementarity. At this stage, DOMAIN REARRANGED METHYLTRANSFERASE 2 (DRM2) is recruited and methylates cytosine in all sequence contexts (CG, CHG, and CHH; H stands for A, C, or T) (Castel and Martienssen, 2013; Matzke et al., 2015). Non-canonical RdDM pathways, that is pathways not involving Pol IV-RDR2-DCL3, have recently been identified but are less well characterized (Cuerda-Gil and Slotkin, 2016). Our previous report left unanswered the question of the nature of the mechanism leading to genomic imprinting in the endosperm of mature seeds. Furthermore, the mechanisms allowing mature seeds to ‘remember’ past cold temperatures in order to further regulate imprinted gene expression was not investigated. Here we addressed these questions by focusing on the case of ALN. To investigate whether ALN paternal allele suppression requires DNA methylation, we pollinated WT Cvi plants with pollen from methyltransferase mutants, met1 (Col ecotype) and drm1drm2, hereafter referred as drm mutants (Ws), lacking functional DRM1 and DRM2. Preferential maternal ALN allele expression was retained in WT x met1 hybrid seed endosperm but not in that of WT x drm (Figure 1A). We also pollinated WT Cvi plants with nrpd1 (Col-0) pollen, deficient in the largest subunit of Pol IV. Interestingly, WT x nrpd1 hybrid seed endosperm retained preferential maternal ALN allele expression (Figure 1A). ALN imprinting necessitates non-canonical RdDM. (A) Sanger sequencing chromatograms at SNPs of ALN. WT plants (Cvi) were pollinated with WT (Col and Ws) and mutant pollen as indicated. RNA was extracted from endosperm of F1 seeds and subjected to RT-PCR followed by Sanger sequencing. Nucleotides at SNP sites are highlighted in red: ‘C’ originates from Cvi and ‘T’ originates from Ws and Col. Representative results are shown from experiments repeated at least 5 times for each genotype. (B) DNA methylation on the ALN 5’ and 3’ flanking regions in endosperm of mature seed. Black box arrows and yellow box arrows show genes and TEs respectively. Blue lines show regions where DNA methylation was studied. Red line (300 bp) shows ALN’s highly methylated 5’ upstream region (referred as ‘POGO region’). All remaining methylation data shown in this figure only correspond to the 300 bp POGO region. Red, blue and green vertical lines represent CG, CHG, and CHH methylation levels, respectively. (C) Percentages of CHH methylation levels corresponding to the POGO region in different RdDM mutants (Materials and methods). drm1drm2 is in Ws background; ago4ago6 is generated after crossing ago4 with ago6 in Ler and C24 background, respectively; all other mutants are in Col-0 background. Percentages of DNA methylation at CG and CHG sites are shown in Figure 1—figure supplement 1. (D) DNA methylation levels in maternal and paternal alleles. DNA extracted from endosperm and embryo of F1 seeds obtained after reciprocally crossing Cvi and Col WT plants was analyzed by sodium bisulfite sequencing. SNPs were used to distinguish maternal and paternal alleles. Filled and open circles represent methylated and unmethylated cytosines, respectively. (E) Percentage of DNA methylation in the POGO region in different tissues. (F) Percentage of DNA methylation in the POGO region in female and male gametes. The data were extracted from published whole genomic DNA methylation data of female (Park et al., 2016) and male (Ibarra et al., 2012) gametes. Altogether, these results show that ALN imprinting requires non-canonical RdDM for paternal allele silencing rather than MET1 or canonical RdDM as previously reported (Gehring, 2013; Vu et al., 2013; Rodrigues and Zilberman, 2015). We therefore hypothesized that ALN imprinting necessitates DNA methylation marks deposited by non-canonical RdDM. Thus, we explored whether genomic DNA neighboring ALN could indeed be targeted by non-canonical RdDM. The 5’ and 3’ flanking regions of ALN contain transposable elements (TEs), which are often associated with DNA methylation (Figure 1B). We analyzed DNA methylation levels in a region of about 1.3 kbp spanning −1500 to −200 bp relative to ALN’s transcription start site (TSS), and in a region of about 1.7 kbp spanning −200 to +1500 bp relative to ALN’s transcription termination site (TTS) (Figure 1B). We identified a heavily methylated region of about one kbp in the 3’ flanking region and a moderately methylated region of about 300 bp located about 1.0 kbp upstream of ALN’s TSS (Figure 1B). Downstream of ALN’s TTS the levels of CHH methylation, which can be mediated by RdDM, were markedly reduced in drm mutants and nrpd1 mutants (Figure 1B). In contrast, in the methylated region upstream of ALN’s TSS, CHH methylation levels in nrpd1 were similar to WT levels unlike those in drm, which were markedly lower (Figure 1B). We also analyzed DNA methylation upstream of ALN’s TSS in nrpe1, deficient in the largest subunit of Pol V, and met1 mutants. Overall CHH methylation levels in met1 were similar to WT levels whereas they were markedly lower in nrpe1 mutants (Figure 1C, and Figure 1—figure supplement 1). Interestingly, the methylated region upstream of ALN’s TSS contains a TE belonging to the AthPOGON1 family previously reported to be a target of non-canonical RdDM mediated by RDR6 and AGO6 (referred as RDR6-RdDM) (Nuthikattu et al., 2013; McCue et al., 2015; Cuerda-Gil and Slotkin, 2016). This methylated region is hereafter referred as ‘POGO region’. Indeed, in ago6 and rdr6 mutants the POGO region CHH methylation levels were lower than those of WT, although not as low as those found in drm or nrpe1 mutants (Figure 1B, and Figure 1—figure supplement 1). CHH methylation levels were also decreased in rdr2 and ago4 mutants and further decreased in rdr2rdr6 and ago4ago6 double mutants (Figure 1C, and Figure 1—figure supplement 1). Altogether, these results show that the POGO region is methylated through a form of RdDM not involving Pol IV, that is a non-canonical form, and involving RDR6 and AGO6 in addition to RDR2 and AGO4. To further investigate whether CHH methylation in the POGO region affects ALN imprinting, we pollinated WT plants with pollen from rdr2rdr6 and ago4ago6 double mutants. Preferential maternal ALN allele expression was lost both in WT x rdr2rdr6 and WT x ago4ago6 hybrid seeds (Figure 1A). These results consolidate the notion that non-canonical RdDM is required for ALN imprinting. This could involve CHH methylation of the POGO region upstream of ALN’s TSS. We previously showed that seed dormancy levels can be regulated by maternal ALN allele expression. Indeed, we showed that aln x WT hybrid F1 seeds obtained after pollinating aln plants with WT pollen have higher dormancy than WT seeds (Piskurewicz et al., 2016). To further assess the role of RdDM in maternal regulation of seed dormancy, we pollinated aln mutant plants with WT and nrpe1 pollen. Dormancy levels in aln x nrpe1 hybrid F1 seeds were lower relative to aln x WT hybrid seeds, further indicating that maternal regulation of seed dormancy requires suppression of ALN paternal allele by RdDM (Figure 1—figure supplement 1C). To assess whether CHH methylation of the POGO region could be involved in suppressing ALN’s paternal allele, we measured allele-specific methylation in the POGO region of hybrid seeds obtained after reciprocally crossing Col and Cvi plants. In embryos, CG methylation levels were similar between parental alleles whereas CHH methylation levels were higher in Cvi alleles (Figure 1D and Figure 1—figure supplement 1). This bias likely reflects accession differences in DNA methylation levels in the POGO region. In the endosperm, CG DNA methylation levels were also similar between parental alleles. However, CHH methylation levels were markedly higher in the paternal allele relative to the maternal alleles (Figure 1D and Figure 1—figure supplement 1). Altogether these results support the notion that preferential maternal ALN allele expression involves ALN paternal allele suppression mediated by methylation of the POGO region through non-canonical RdDM. ALN expression is not silenced in seedlings and flowers (Schmid et al., 2005; Watanabe et al., 2014). We observed that seedlings and flowers had similar CG methylation levels in the POGO region relative to the mature endosperm or embryo. In contrast, they had markedly lower CHH methylation levels (Figure 1E). This further suggests that methylation of CHH sites in the POGO region, mediated by non-canonical RdDM, rather than CG sites, which are present at low density in the POGO region, are involved in suppressing ALN paternal allele expression. Available genomic methylation data revealed that CHH methylation levels in the POGO region are low (about 4%) in the central cell (Figure 1F and Figure 1—figure supplement 1) (Calarco et al., 2012; Ibarra et al., 2012; Hsieh et al., 2016; Park et al., 2016). DME is active in the central cell where it establishes imprinted gene expression in numerous imprinted genes after removing DNA methylation (Choi et al., 2002; Park et al., 2016). In dme mutants CHH methylation levels in the central cell remain low and similar to those in WT plants (Figure 1F). Thus, in the case of ALN, higher paternal CHH methylation in the POGO region does not result from DME-dependent CHH methylation removal in the central cell. In the case of sperm cells, different POGO region methylation levels are reported by three different groups but they are systematically higher (48%, 34% and 9%) than those reported in the central cell (Figure 1F and Figure 1—figure supplement 1) (Calarco et al., 2012; Ibarra et al., 2012; Hsieh et al., 2016). In addition to the central cell, DME is also active in the vegetative cell of pollen (Schoft et al., 2011; Ibarra et al., 2012). In WT, CHH methylation levels are low in the vegetative cell (about 3.5%), but they increase markedly (about 25%) in dme mutants, suggesting that DME promotes low CHH methylation in the vegetative cell (Figure 1F). In dme mutants, CHH methylation levels in sperm cells are reduced but they remain higher (>20%) relative to those in the central cell (Figure 1F) (Ibarra et al., 2012). Altogether, these data suggest that preferential paternal ALN allele POGO region CHH methylation is a phenomenon specific to the male germ cell lineage, which is further maintained in the endosperm after fertilization. In turn, this leads to paternal allele suppression of ALN expression in the endosperm upon imbibition of mature dormant seeds. Seed development under cold temperatures leads to increased seed dormancy levels, which is associated with low ALN expression upon seed imbibition (Piskurewicz et al., 2016; Penfield and MacGregor, 2017). Interestingly, ALN imprinting was lost in seeds produced at 10 ˚C suggesting that cold perturbs the DNA methylation imprints associated with ALN (Figure 2A). In seeds produced at 10 ˚C, we observed that the length of the methylated POGO region expanded by 200 bp and CHH methylation levels markedly increased while the DNA methylation levels downstream of ALN’s TTS were similar to those observed in seeds produced at 22 ˚C (Figure 2B). Cold temperatures increase methylation levels and expand the length of the ATHPOGON1-containing region subjected to methylation through RDR6-RdDM. (A) Sanger sequencing chromatograms at SNPs of ALN. WT (Cvi) plants cultivated at 22 ˚C or 10 ˚C were pollinated with WT (Col) pollen. RNA was extracted from endosperm of F1 seeds and subjected to RT-PCR followed by Sanger sequencing. Nucleotides at SNP sites are highlighted in red: ‘C’ originates from Cvi and ‘T’ originates from Col. Representative results are shown from experiments repeated at least five times for each genotype. (B) DNA methylation in the ALN 5’ and 3’ flanking regions of the endosperm of mature seeds. Blues lines show regions where DNA methylation was studied. Dashed red line (500 bp) shows the region analyzed for DNA methylation levels. All remaining methylation data shown in this figure only correspond to this 500 bp region. Red, blue and green vertical lines represent CG, CHG, and CHH methylation levels, respectively. (C) Histograms show percentage of DNA methylation in the 500 bp region. DNA extracted from endosperm of WT seeds and RdDM mutant seeds produced at 22 ˚C or 10 ˚C was analyzed by sodium bisulfite sequencing. (D) Cold-induced and seed-specific DNA methylation. Seeds produced at 22 ˚C or 10 ˚C were sown and the resulting seedlings cultivated at 22 ˚C for three weeks prior to DNA extraction and sodium bisulfite sequencing analysis (Whole seedling). Cold-induced CHH methylation was observed in nrpd1 but not in drm or nrpe1 mutants (Figure 2C and Figure 2—figure supplement 1). This strengthens the notion that the POGO region is a target of non-canonical RdDM. Indeed, cold-induced CHH methylation was dependent on RDR6 and AGO6 but not on RDR2 or AGO4 (Figure 2C and Figure 2—figure supplement 1). These results therefore show that non-canonical RDR6-RdDM is required for cold-induced CHH methylation of the POGO region. Increased CHH methylation in the POGO region was observed both in the endosperm and embryo from seeds produced at 10 ˚C, but not in the flowers from plants cultivated at 10 ˚C (Figure 2D). This indicated that cold-induced CHH methylation in mature seeds takes place in gametes or in fertilization tissues or both. Previous reports showed that AGO6 accumulates in gamete precursor cells (McCue et al., 2015). Furthermore, published microarray data show that AGO6 expression is rather tissue-specific, being expressed in shoot apex, mature pollen and developing seeds (Schmid et al., 2005). In contrast, RDR2, RDR6, and AGO4 expressions are more ubiquitous and higher relative to that of AGO6 (Schmid et al., 2005). We therefore hypothesized that cold-induced POGO region CHH methylation in mature seeds results from cold-induced stimulation of AGO6 expression in gametes or in fertilization tissues or both. To test the hypothesis, we analyzed AGO6-GFP protein localization in developing seeds using an endogenous AGO6 promoter reporter line (pAGO6:AGO6-GFP) (McCue et al., 2015). Consistent with microarray data, we observed AGO6-GFP fluorescence in seeds developing at 22 ˚C. Strikingly, cold (10 ˚C) markedly increased the AGO6-GFP fluorescence in the pre-fertilization ovule and in developing seeds relative to warm temperatures (22 ˚C) (Figure 3A). Consistent with microarray data, at 22 ˚C AGO6 mRNA expression is low in pre-fertilization ovules relative to stamens (Figure 3B). At 10 ˚C, AGO6 mRNA expression is induced in pre-fertilization ovules (Figure 3B). This suggests that methylation of the POGO region could be stimulated by cold in the female gamete prior to fertilization. Furthermore, we found that AGO6 expression was higher in stamen and early developing seeds in plants cultivated at 10 ˚C relative to plants cultivated at 22 ˚C (Figure 3B). Expression levels of AGO4 were also increased in seeds developing at 10 ˚C relative to those developing at 22 ˚C (Figure 3B). Expression levels of RDR2 and RDR6 were not significantly changed in response to cold (Figure 3A and B). AGO6 expression is tissue-specific and is stimulated by cold. (A) pAGO6::AGO6-GFP and pRDR6::RDR6-GFP transgenic lines were used to image AGO6-GFP and RDR6-GFP fluorescence, respectively, at various stages of ovule and seed development using confocal laser-scanning microscopy. Plants lacking the transgene are shown as a negative control (No transgene). Chlorophyll auto-fluorescence appears in red. Arrows indicate pre- and after-fertilization ovules. (B) qRT-PCR analysis of AGO6, AGO4, RDR2, and RDR6 mRNA accumulation in plants cultivated at 22˚C and 10˚C. RNA was extracted from stamens (Stamen), pre-fertilization ovules (Pre-f. ovule), developing seeds at the heart stage (Seed early) and developing seeds at the mature green stage (Seed late). Expression levels were normalized to those of PP2A. Error bars indicate SD from three technical replicates. Experiments were repeated two times giving similar results. Taken together these results suggest that cold temperatures could stimulate AGO6 expression and product accumulation in gametes and fertilization tissues. They support the hypothesis that cold stimulates RDR6-RdDM in male and female reproductive tissues or early developing seeds or both, thus leading to increased CHH methylation of the POGO region in mature seeds (Figure 4—figure supplement 3). In turn, increased methylation of ALN maternal allele would lead to loss of imprinting. Furthermore, seedlings arising from seeds produced at 10 ˚C or at 22 ˚C had similar methylation levels in the POGO region (Figure 2D). This strongly suggests that after germination cold-induced CHH methylation is lost as the combined result of cell division and absence of AGO6 expression in seedlings (McCue et al., 2015). We investigated whether changes in the POGO region CHH methylation are associated with changes in ALN endosperm expression levels. ALN endosperm expression upon seed imbibition was higher in WT seeds produced at 22 ˚C relative to seeds produced at 10 ˚C, as previously shown (Figure 4A) (Piskurewicz et al., 2016). In nrpd1 mutant seeds produced at 10 ˚C, in which CHH methylation is increased by cold, ALN expression was suppressed similarly to WT (Figure 4A). In contrast in drm mutants produced at 10 ˚C, ALN expression was comparable to that found in drm seeds produced at 22 ˚C. Changes in the POGO region methylation levels correlate with changes in ALN expression and dormancy levels. (A) qRT-PCR analysis of ALN mRNA accumulation in WT, nrpd1 and drm1drm2 endosperm. RNA was extracted from endosperm of seeds produced at 22˚C and 10˚C and imbibed for 48 hr. ALN expression levels were normalized to those of PP2A. Error bars indicate SD of results from three technical replicates. Experiments were repeated three times giving similar results. (B) Analysis of reporter expression driven by ALN upstream sequences. Two different lengths of ALN upstream sequences (open box) were fused to GUS gene (filled box) and transformed into WT plants (Ws background). RNA was extracted from endosperm of seeds produced at 22˚C and 10˚C and imbibed for 48 hr. GUS expression levels were normalized to those of PP2A. Analysis was performed on three independent transgenic lines. Error bars indicate SD of results from three technical replicates. (C) Histograms show percent germination in populations of seeds produced 10 ˚C. Germination was scored 96 hr after seed imbibition (three biological replicates, n = 80–120). drm1drm2 is in Ws background; all other mutants are in Col-0 background. (D) Inducing DNA methylation of the AthPOGON1-containing region upstream of ALN. 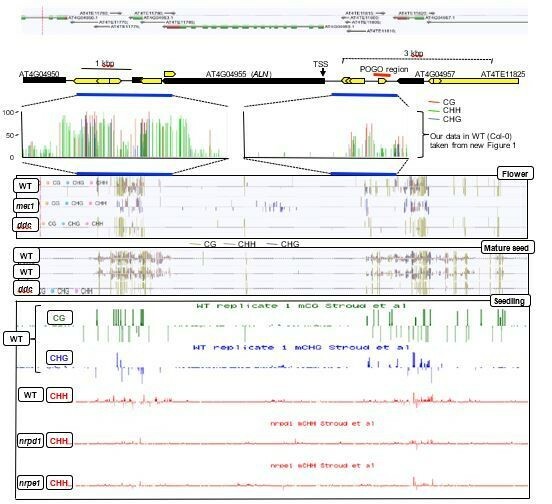 A DNA fragment covering AthPOGON1 (indicated by a green line) was cloned into a RNAi vector to produce double stranded inverted repeats (Materials and methods) and transformed into WT plants (Ws background). Dormancy levels, CHH methylation levels of endogenous ALN upstream sequences (Materials and methods) and ALN expression levels were analyzed for independent transgenic lines as shown. For the analysis of dormancy levels, seeds were after-ripened for 10 days, and germination was scored 72 hr upon seed imbibition (three replicates, n = 100). RNA was extracted from endosperm 48 hr after imbibition. ALN expression levels were normalized to those of PP2A. Error bars indicate SD of results from three technical replicates. To further investigate the role of DNA methylation to regulate ALN gene expression, we generated transgenic lines where the expression of the GUS reporter gene is controlled by sequences upstream the ALN’s TSS that either lack (pALN-845) or contain (pALN-1525) the highly methylated POGO region (Figure 4B). In three independent pALN-1525 transgenic lines, harboring the POGO region, GUS expression was suppressed in seeds produced at 10 ˚C relative to that in seeds produced at 22 ˚C (Figure 4B). In contrast in three independent pALN-845 lines, lacking the POGO region, GUS expression levels were similar between seeds produced at 22 ˚C and those produced at 10 ˚C (Figure 4B). These results suggest that the POGO region indeed contains regulatory elements necessary to suppress ALN transcription in response to cold during seed development. They support the notion that cold-induced CHH methylation suppresses ALN expression upon seed imbibition. ALN is a negative regulator of seed dormancy and ALN expression levels affect seed dormancy levels (Piskurewicz et al., 2016). We analyzed seed dormancy levels in various RdDM mutant seeds produced at 22˚C and 10˚C. WT and RdDM mutant seeds produced at 22 ˚C had no detectable dormancy after a few days of after-ripening (Figure 4—figure supplement 1). ago4 and rdr2 mutant seeds produced at 10 ˚C increased their dormancy similarly to that of WT seeds. However, cold-produced drm, nrpe1, ago6, and rdr6 mutant seeds, unable to increase POGO region methylation, were less dormant compared to WT (Figure 4C and Figure 4—figure supplement 1). These results establish a strong positive correlation between POGO region methylation and dormancy levels in seeds produced at 10 ˚C. However, we also observed that nrpd1 seeds produced at 10 ˚C were less dormant than WT seeds even though they increased CHH methylation (Figure 4C and Figure 4—figure supplement 1). One possible explanation for this apparent discrepancy is if Pol IV promotes dormancy irrespective of temperature during seed development. To better reveal differences in dormancy levels of seeds produced at 22 ˚C, we used suboptimal germination conditions (De Giorgi et al., 2015). After one week of after-ripening, nrpd1 seeds were able to germinate unlike WT and drm seeds, indeed suggesting Pol IV promotes seed dormancy irrespective of the temperature (Figure 4—figure supplement 1). As expected, seeds produced at 10 ˚C from plants overexpressing ALN had low dormancy levels (Figure 4C and Figure 4—figure supplement 1). Furthermore, seeds produced at 10 ˚C from aln drm1 drm2 and aln drm1 drm2 cmt3 mutants had high dormancy levels similar to WT seeds (Figure 4C and Figure 4—figure supplement 1). These observations strongly suggest that high ALN expression in drm mutants contributes to their lower seed dormancy levels. It is reported that RNAi targeted to specific loci can induce de novo DNA methylation (Mette et al., 1999; Mette et al., 2000; Matzke et al., 2004). To further study the role of POGO region methylation in cold-dependent ALN expression suppression and regulation of dormancy, we generated transgenic lines expressing an inverted repeat construct to be transcribed into dsRNA in order to generate siRNAs targeting the POGO region. In the T2 generation of transgenic plants, different dormancy levels were observed among different transgenic lines cultivated at 22 ˚C (Figure 4D and Figure 4—figure supplement 2). Among 22 transgenic lines, only four lines produced seeds with dormancy levels similar to WT seeds. The remaining 18 lines had higher dormancy levels compared to WT seeds. We selected four lines producing seeds with the highest dormancy levels and two lines producing seeds with dormancy levels similar to WT seeds. 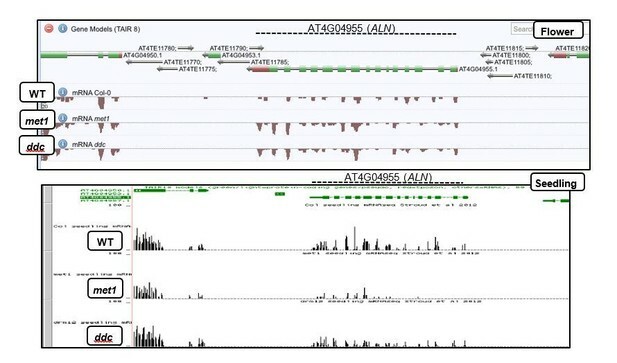 In the low dormancy lines endogenous POGO region CHH methylation and ALN expression levels were similar to those of WT plants (Figure 4D and Figure 4—figure supplement 2). In contrast, in the high dormancy lines endogenous POGO region CHH methylation levels were markedly increased relative to those in WT plants and ALN expression was suppressed (Figure 4D and Figure 4—figure supplement 2). 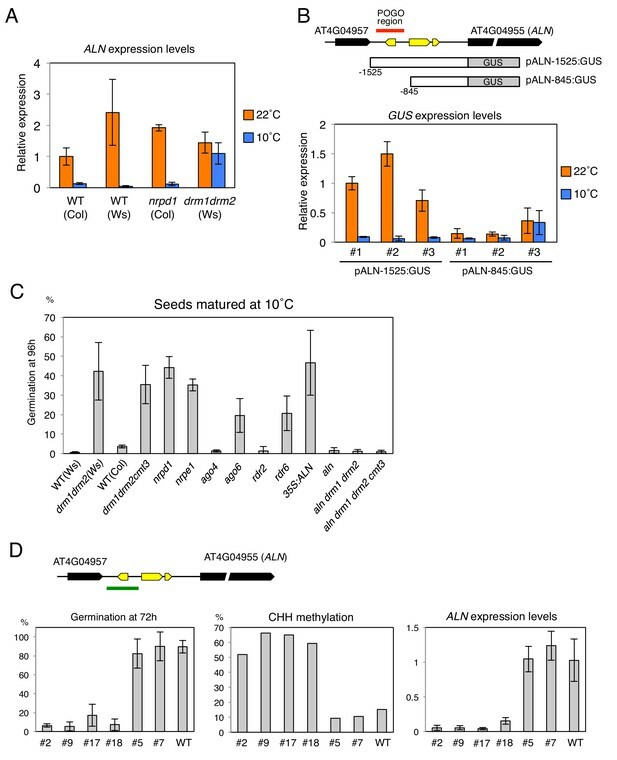 Altogether, these results support a model where cold-induced and RDR6-RdDM-dependent ALN promoter CHH methylation promotes seed dormancy by repressing ALN expression in seeds (Figure 4—figure supplement 3). Here we showed that ALN preferential maternal allele expression depends on DNA methylation of the paternal allele through non-canonical RdDM rather than MET1 as previously proposed for numerous MEGs (Gehring, 2013; Rodrigues and Zilberman, 2015). An association between RdDM and imprinted gene expression early upon fertilization has previously being described showing that some imprinted genes require canonical RdDM for paternal allele suppression; however, they also require MET1 activity (Vu et al., 2013). The low abundance of CG sites in the ALN promoter suggests that CG methylation is not involved in suppressing ALN expression. In contrast, we showed that CHH methylation of POGO region located upstream of ALN’s TSS positively correlate with low ALN expression. 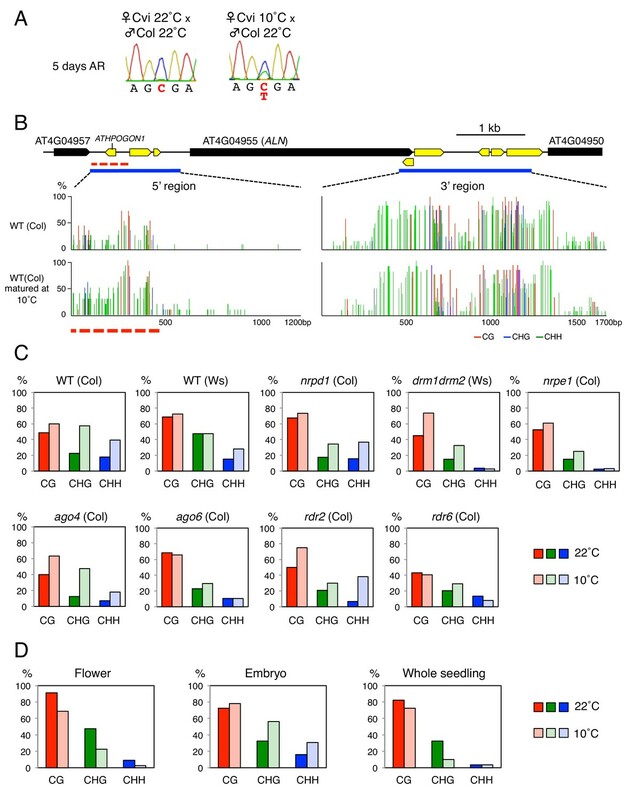 This indicates that CHH methylation mediated by RdDM regulates ALN gene expression. Our results indicate that ALN paternal allele CHH methylation is established in sperm cells during gametogenesis and maintained during seed development, which may be due to non-canonical RdDM specifically taking place in the male gamete lineage or fertilization tissues or both (Figure 4—figure supplement 3). However, it remains to be understood how higher CHH methylation levels are maintained in the paternal allele relative to the maternal allele after fertilization (Figure 1C). Guiding siRNAs for RdDM are not expected to discriminate paternal from maternal alleles. Indeed, maternal ALN allele CHH methylation levels are higher in the endosperm relative to those observed in flower and seedling tissues though they remain, in the endosperm, lower relative to those of the paternal ALN allele (Figure 1D and E). One possible explanation for this discrimination is that RdDM is more efficient on methylated DNA, thus maintaining higher paternal ALN allele methylation over time after fertilization. Consistent with this hypothesis, Pol V is preferentially associated with methylated loci (Wierzbicki et al., 2012). It was shown that the SET domain proteins SUVH2 and SUVH9 bind to methylated DNA and facilitate the recruitment of Pol V to RdDM-targeted loci (Liu et al., 2014). Thus, after DNA replication, Pol V might be preferentially associated with hemi-methylated paternal chromosome, which would then facilitate DRM2-dependent CHH methylation of both strands. Another possibility is that higher paternal allele CHH methylation levels at the time of fertilization serve as a primary imprint, which can generate a secondary imprint such as histone modification. This secondary imprint would then attract RdDM and thus maintain higher levels of CHH methylation in the paternal ALN allele. In plants, H3K27 trimethylation was shown to serve as a secondary imprint in some paternally expressed genes (Gehring, 2013; Rodrigues and Zilberman, 2015). In these cases, DNA hypomethylation of the maternal allele promotes H3K27 trimethylation, which suppresses maternal allele expression. This scenario could also operate in the case of ALN. Consistent with th possibility that H3K27 trimethylation could serve as a secondary imprint, a recent report showed that H3K27 trimethylation also takes place in hypermethylated paternal alleles (Moreno-Romero et al., 2016). Previous studies associated environmental cues, including cold temperatures, with changes in CHH methylation levels in Arabidopsis and different plant species (Dubin et al., 2015; Secco et al., 2015; Wibowo et al., 2016; Secco et al., 2017). In most cases changes are transient, which is consistent with the notion that CHH methylation can be a dynamic process contrarily to CG methylation, which is faithfully maintained by MET1 after each cell division (Kawakatsu et al., 2017). Here we found that CHH methylation levels of the POGO region located upstream of ALN’s TSS are stimulated by cold temperatures during seed development, which represses ALN expression, thus promoting seed dormancy. Interestingly, increased cold- and RDR6-RdDM-dependent stimulation of CHH methylation is observed in seed tissues but not in flowers. This reflects the tissue-specific activity of RDR6-RdDM (Figure 3A and B). Cold-induced CHH methylation is lost in the seedling after germination (Figure 2D). It has been reported that there are resetting mechanisms of epigenetic changes induced by environmental cues (Choi et al., 2009; Crevillén et al., 2014; Iwasaki and Paszkowski, 2014; Crisp et al., 2016). One notable example is FLC, encoding a repressor of flowering. FLC expression is suppressed by H3K27 trimethylation by prolonged cold (vernalization). H3K27 trimethylation-imposed suppression of FLC expression is maintained after the vernalization period and this epigenetic mark is then removed during late embryo development (Berry and Dean, 2015). This ‘resetting’ mechanism ensures that the plant’s progeny can once again adapt appropriately their flowering time in a new environment. Similarly, we propose that cold-induced CHH methylation of the POGO region located upstream of ALN’s TSS is a seed-specific mechanism allowing the seed to keep information of past cold temperatures in order to optimize seed germination timing. After germination, the information is erased in the embryo thus allowing optimal gene expression once again in the next generation. Arabidopsis mutants, met1‐1 (Kankel et al., 2003), nrpd1a-3 (Herr et al., 2005), drm1-1 drm2-1 (Cao and Jacobsen, 2002), nrpe1 (SALK_017795), ago4 (SALK_027933), ago6-2 (SALK_031553), ago4-1 ago6-1 (Zheng et al., 2007), rdr2 (SALK_206644), rdr6-11 (Peragine et al., 2004), rdr2-1 rdr6-15 (Garcia-Ruiz et al., 2010) were obtained from The European Arabidopsis Stock Centre (RRID:SCR_004576). pAGO6::AGO6-GFP (McCue et al., 2015) and pRDR6::RDR6-GFP (McCue et al., 2012) transgenic lines were kindly provided by Dr. Keith Slotkin. 35S :ALN (Watanabe et al., 2014) construct was kindly provided by Dr. Atsushi Sakamoto. Plants were grown at 21–23°C, 16 hr/8 h day/night photoperiod, light intensity of 80 μE·m−2·s−1, humidity of 70%. For cold temperature treatment, plants were transferred to growth cabinets at 10°C after bolting. For germination assays, seeds were surface-sterilized (5% Bleach, 0.05% Tween) and sown on a Murashige and Skoog medium containing 0.8% (w/v) Bacto-Agar (Applichem). Between 80 and 150 seeds were examined with a Stemi 2000 (Zeiss) stereomicroscope and photographed with a high-resolution digital camera (Axiocam Zeiss) at different times of seed imbibition. For the GUS reporter gene construct, a 1525 bp fragment spanning −1525 to −1, and a 845 bp fragments spanning −845 to −1 relative to the TSS of ALN were amplified from WT Col-0 genome by PCR and cloned into BamHI and SalI sites flanking the GUS coding region of pBI101 plasmid. For the RNAi vector, the 601 bp flagment spanning −846 to −1446 bp relative to ALN’s TSS was similarly amplified by PCR and cloned into the pRNAi-GG plasmid following the protocol from Yan et al. (2012). The 35S::ALN plasmid was described previously (Watanabe et al., 2014). The resulting constructs were introduced into Agrobacterium tumefaciens GV3101 strains to transform wild-type Col-0 or Ws plants by the floral‐dip method as previously described (Clough and Bent, 1998). Plants from T2 and T3 generation were used for analysis. Primers used in this study are listed in Supplementary file 1. Genomic DNA from embryo and endosperm was extracted as described previously (Piskurewicz and Lopez-Molina, 2011). Genomic DNA from flower and seedling was extracted with DNeasy Plant Mini Kit (Qiagen). Bisulfite DNA conversion was performed using EpiTect Bisulfite Kits (Qiagen). PCR was performed with primers listed in Supplementary file 1. Amplified fragments were cloned into the pGEM-T Easy Vector (Promega) and 10 to 12 independent clones for each sample were sequenced. Experiments were repeated at least twice. Sequencing data were analyzed with Kismeth (http://katahdin.mssm.edu/ kismeth). Total RNA was extracted as described previously (Piskurewicz and Lopez-Molina, 2011). Total RNAs were treated with RQ1 RNase-Free DNase (Promega) and reverse-transcribed using ImpromII reverse transcriptase (Promega) and oligo(dT)15 primer (Promega). Quantitative RT–PCR was performed by using the ABI 7900HT fast real-time PCR system (Applied Biosystems) and Power SYBR Green PCR master mix (Applied Biosystems). Relative transcript levels were calculated using the comparative ΔCt method and normalized to the PP2A (AT1G69960) gene transcript levels. Primers used in this study are listed in Supplementary file 1. The confocal fluorescent images were obtained by a Zeiss LSM 700 confocal microscope and ZEN microscope and imaging software package (Zeiss). GFP signals were taken with 488 nm laser and 520/35 nm band-pass filter. Chlorophyll autofluorescence signals were taken with 639 nm laser and 640 LP band-pass filter. Journal of Experimental Botany 68:857–869. Annual Review of Genetics 47:187–208. The Plant Cell Online 18:1360–1372. Biochimica Et Biophysica Acta (BBA) - Gene Structure and Expression 1677:129–141. Annual Review of Plant Biology 66:243–267. Journal of Experimental Botany 68:819–825. Methods in Molecular Biology 773:151–164. Current Opinion in Plant Biology 39:1–7. Plant, Cell & Environment 37:1022–1036. Thank you for submitting your article "Non-canonical RNA-directed DNA methylation participates in maternal and environmental control of seed dormancy" for consideration by eLife. Your article has been reviewed by four peer reviewers, including Daniel Zilberman as the Reviewing Editor and Reviewer #1, and the evaluation has been overseen by Detlef Weigel as the Senior Editor. The following individuals involved in review of your submission have agreed to reveal their identity: Steven Penfield (Reviewer #2); Xiaoqi Feng (Reviewer #3). The authors of this manuscript report that the non-canonical AGO6-RdDM pathway establishes imprinted expression of the dormancy regulator ALN in the endosperm. The authors show that (i) methylation of the paternal ALN allele depends on Pol V, DRM1/2, AGO4/6 and RDR2/6, (ii) that CHH methylation on ALN is present in sperm, (iii) that CHH methylation levels increase at lower temperatures, (iv) that AGO6 and AGO4 are expressed higher in seeds at lower temperatures, (v) that dormancy levels of seeds produced at lower temperature depend on the regulators of the non-canonical RdDM. 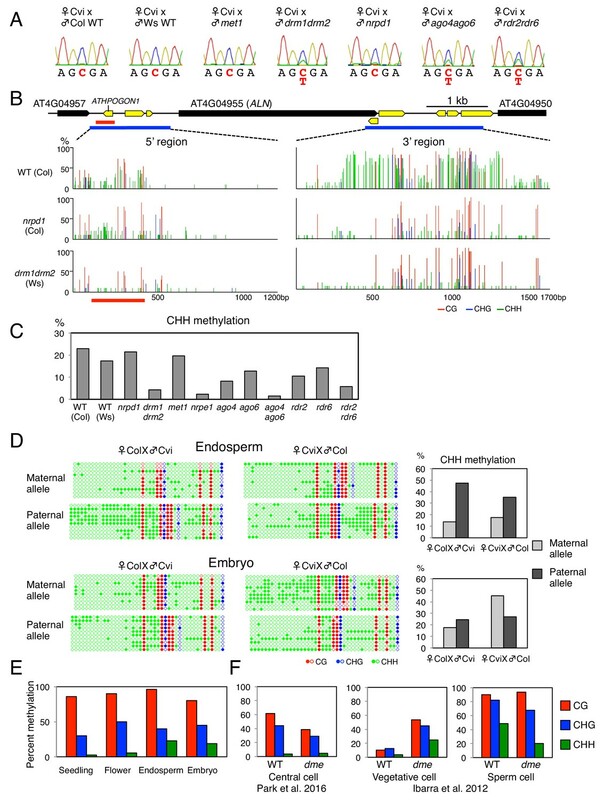 Based on this data the authors propose that ALN is methylated by the AGO6-RdDM in sperm and that this allele-specific CHH methylation is maintained after fertilization. The authors discuss two scenarios that may explain how allele-specific RdDM could be maintained after fertilization. The report of environmentally induced RdDM regulating gene expression, imprinting and seed dormancy is potentially very interesting. There are, however, several points the authors should address. In general, the reviewers were convinced that temperature affected AGO6 expression and dormancy. The reviewers were not convinced that parent-of-origin effects on ALN were relevant, as it is not clear how ALN variation affects dormancy at low temperatures. The reviewers were also not convinced that methylation of AthPOGON1 regulates ALN expression, or that the effects of the RdDM pathway on dormancy go through ALN. The revisions requested below are meant to clearly demonstrate that DNA methylation-regulated imprinted expression of ALN is modulated by temperature and responsible for the reduced dormancy of RdDM mutants in the cold. Not all the suggested experiments may be required to do this, and there may be alternate approaches that the authors are welcome to employ. 1) A major weakness of this paper is that although the methylation patterns in WT and mutants are correlated to gene expression, there isn't an experiment showing that methylation of a particular sequence causes ALN expression changes. If the methylation covered a known regulatory region, or the transcriptional start site, this would be less of a concern. However, the causal relationship between the RdDM-induced DNA methylation and the imprinting of ALN was deduced from the DNA methylation at a small (300 bp) AthPOGON1 TE that is about 1.2 Kb upstream of the ALN TSS. This is of concern in part because the 5' prime region of ALN is generally TE rich, containing a repetitive region of 3 Kb that is only 400 bp upstream of ALN TSS; so is the 3' prime of ALN (a repetitive region about 5 kb including a TE overlapping ALN TTS). The available DNA methylome data from seed and pollen, and siRNA data from pollen and leaves, suggest that AthPOGON1 does not behave differently from other repeats in ALN's promoter: the whole 3 Kb repetitive region is hypomethylated in the maternal endosperm and hypermethylated in sperm. Therefore, only focusing on the methylation pattern at AthPOGON1 is misleading (the authors have no evidence that this specific element matters), and it is necessary to extend the DNA methylation analyses to cover the 5' and 3' prime regions of ALN. 2) Extending the methylation analyses to the larger repetitive regions around ALN may also help to explain the conflicting results shown in Figure 1: Figure 1A shows imprinting of ALN does not require Pol IV, however, Figure 1B shows AGO4 and RDR2 have larger impacts on the endosperm methylation than the non-canonical components AGO6 and RDR6, respectively. Additionally, published rdr2 mutant sperm data show that the hypermethylation at ALN promoter (and the 3' prime region) is entirely RDR2 dependent. Based on Figure 1B and published sperm data, it would be surprising if canonical RdDM does not contribute to ALN imprinting at normal conditions. Analysing a larger region and/or replicating the experiments would sharpen the data and potentially alter some of the conclusions regarding the roles of canonical vs. non-canonical RdDM. 3) After a more thorough investigation of methylation around ALN, the authors should consider targeting methylation to the most likely regulatory region. If methylation that is targeted to a specific part of the ALN promoter (or 3' region) in the mother plant, in a way that recapitulates the methylation phenotype at 10°C, shuts down maternal ALN expression and increases dormancy, this would constitute strong evidence for the authors' claims about environmental and epigenetic regulation of ALN expression and dormancy, even if RdDM may also regulate dormancy in other ways. 4) The authors should consider using genetics to demonstrate that (at least some of) the effects of RdDM on dormancy go through ALN, for example by making aln;polV double mutants. 5) The authors ignore the potential role of the DME demethylase in establishing imprinting. The hypomethylation patterns upstream of ALN in the maternal endosperm and vegetative cell are both dependent on the DME demethylase. The TTS-spanning repetitive region 3' prime of ALN is also hypomethylated in the same fashion by DME in the seed and pollen. These published data should be integrated into the authors' models. 6) The authors should show that maternal regulation of ALN is important for the observed phenotypes. The latter could be tested by comparing germination levels of seeds derived from the cross aln x wild type and aln x nrpe1. Based on previously published work of the authors, seeds from the first cross should have increased dormancy, which is expected to be lower in the cross using nrpe1 as pollen donor that should cause ALN activation. The authors could also cross aln with nrpe1/+. If CHH methylation is established in sperm, in an nrpe1 heterozygous mutant a population of early and late germinating seeds would be expected. 7) Statistical treatment should be improved. It is unclear on how many replicates all analyses are based on. If error bars are provided it is unclear whether they are based on biological or technical replicates. 8) The authors propose that cold-induced CHH methylation in mature seeds is the result of seed-specific DNA methylation. Nevertheless, in their model in Figure 4—figure supplement 2B they propose that at 10 degrees the non-canonical RdDM pathway is active in the female gametophyte, apparently contradicting their findings. This requires clarification. We apologize for not have been explicit enough: in the first version of the manuscript we analyzed in fact the methylation of a region spanning -1500 to -200 bp (about 1.3. kbp) relative to ALN’s TSS but we only showed the data for the 300 bp region covering AthPOGON1 (this 300 bp region is referred in the revised version as “POGO region”). In the revised version of the manuscript we provide new methylation data for downstream ALN’s TTS and, more importantly, two new experiments that independently test the model that methylation of the POGO region leads to suppression of ALN expression: 1) a promoter reporter experiment using 5’ ALN flanking sequences that either contain or lack the POGO region (Figure 4B) and 2) an experiment where we promote methylation of the POGO region by means of a transgene expressing an inverted repeat containing POGO region sequences (Figure 4D). The results of these experiments strongly support our hypothesis (see further below). We respectfully only partially agree with you. The “repetitive region of 3Kb” you refer to located 400 bp upstream of ALN’sTSS (delineated with a dashed line in Author response image 1) does not really consist of repetitive elements disposed over 3 Kb. It contains a gene (AT4G04957) flanked on its 5’ side by a long and short TE (AT4TE11825 and AT4TE11820) and on its 3’ side by a few interspersed TEs that include AthPOGON1 (AT4TE11815). Publicly available data suggest that only the region covering the gene At4G04957 is hypermethylated in all contexts. We have reproduced these data in Author response image 2. 1) In flowers (Lister et al., 2008) and seedlings (Stroud et al., 2013) the At4G04957 region is hypermethylated. 2) In seedlings CHH methylation present in the At4G04957 hypermethylated region is similarly reduced in nrpd1 and nrpe1 mutants, indicating that it is targeted by canonical RdDM. 3) In mature seeds (Kawakatsu et al., 2017), overall CHH methylation levels tend to increase in both the 3’ and 5’ sequences of ALN. This includes the POGO region and the region 5’ of AT4G04957 (covering part of AT4TE11825) but excludes the TEs (AT4TE11800, AT4TE805 and AT4TE810) located between AthPOGON1 (AT4TE11815) and the ALN’s TSS, which are not markedly methylated. Concerning our data about methylation in the 5’ side of ALN, in the first version of the manuscript we were showing in Figure 1 only methylation data in the POGO region (indicated by a red line in Author response image 2) but we had sequenced a region going from the 3’ end of At4G04957 to about 200 bp upstream of the ALN TSS, i.e. methylation data corresponding to 1.3 Kbp on the 5’ side of ALN (indicated by a blue line in Author response image 2). These methylation data are now shown in their entirety in the revised Figure 1. Our data are consistent with publicly available data, i.e. they show that in the 3’ flanking region of At4G04957 there is no hypermethylation as observed in the region covering At4G04957. Rather they show that only the POGO region that we depicted in the first version of the manuscript contains a substantial amount of methylation. The other TEs (AT4TE11800, AT4TE805 and AT4TE810) in the region going from 400bp upstream of the ALN TSS to 5’ of AthPOGON1 (AT4TE11815) are not substantially methylated, consistent with publicly available data. We fully agree with you concerning the 3’ ALN region: it contains TEs and publicly available data indeed show that it is hypermethylated in all contexts in seedlings, flowers and seeds (also reproduced above). In the revised manuscript, we have performed sodium bisulfite over a 1.7 kbp interval in this region. Our data indeed confirm it is hypermethylated (the data are shown above and also shown in new Figure1). Importantly, our data show that in nrpd1 mutants CHH methylation is mainly lost in the 3’ ALN region whereas it is retained in the POGO region located 5’ of ALN (new Figure 1). One question you are raising is that of the importance of the hypermethylation 5’ of ALN (i.e., that found in the region covering At4G04957) and 3’ of ALN to suppress ALN gene expression. Firstly, it should be pointed out that publicly available data show that ALN expression is not suppressed in seedlings nor in flowers. Indeed ALN expression is comparable to that of ALN’s neighboring genes (AT4G04940, AT4G04960, AT4G04970). Thus ALN is an imprinted gene unlike many imprinted genes described by the imprinting “standard model” whereby DME activates the maternal allele expression in the central cell in a gene whose expression is otherwise shutdown by methylation throughout the plant’s life cycle. Secondly, publicly available data (see above)show that the ALN’s 5’ and 3’ hypermethylated regions substantially lose their methylation in met1 or drm1drm2cmt3 (ddc) mutants (flower) and yet this is not associated with a substantial increase in ALN expression in flower (Lister et al., 2008) or seedling (Stroud et al., 2012) (see Author response image 3). Thirdly, we showed that ALN imprinting is preserved in met1 and nrpd1 indicating that these hypermethylated regions play no substantial role to suppress the ALN paternal allele. Thus, there is no evidence suggesting that ALN’s 5’ and 3’ hypermethylated regions play a substantial role in suppressing ALN expression. Publicly available data show that CHH methylation increases in mature seeds in a region upstream of At4G04957 covering part of AT4TE11825. We cannot rule out that this region, and indeed additional sequences in chromosome 4, is also targeted by non-canonical RdDM, in addition to the POGO region, and that it could also participate to suppress ALN expression. However, the data presented in the revised manuscript show that at least the POGO region and its methylation plays a significant role to repress ALN expression and promote dormancy. We repeated several times the experiment in Figure 1A and we stand behind the conclusion that Pol IV is not necessary for ALN imprinting. Canonical RdDM is defined by the pathway functioning through Pol IV-RDR2-DCL3. So the observation that Pol IV is not necessary for imprinting implies that canonical RdDM is not necessary for imprinting. Given that ALN imprinting requires DRMs rather than MET1, it follows that ALN imprinting requires non-canonical RdDM. AGO4 and AGO6 act redundantly in many loci (Zheng et al., 2007). In addition, RDR2 and RDR6 can also function redundantly for antisense RNA synthesis (Matsui et al., 2017). We therefore do not see a conflict between Figure 1A and 1B: that imprinting does not require Pol IV does not exclude that AGO4 and RDR2 could have higher impact on methylation than AGO6 and RDR6, respectively. We now provide new data showing that ALN imprinting is lost in ago4ago6 and rdr2rdr6 (new Figure 1A) mutants, consistent with the low methylation in the POGO region (Figure 1B). We propose that the non-canonical form of RdDM responsible for ALN imprinting involves the components AGO4, AGO6, RDR2 and RDR6. On the other hand, we propose that the RDR6-RdDM pathway (AGO6, RDR6) is specifically involved in cold-dependent suppression of ALN expression by promoting methylation in the POGO region. We studied the role of the AthPOGON1-containing region in cold-dependent ALN expression suppression and regulation of dormancy in two ways. First, we generated transgenic lines where the expression of the GUS reporter gene is controlled by the 5’ ALN flanking region that either lacks (pALN-845) or contains (pALN-1525) the highly methylated and AthPOGON1-containing region. In independent lines, GUS expression was suppressed in seeds produced at 10˚C in pALN-1525 lines but not in pALN-845 lines (New Figure 4B). Second, we transformed WT plants with a transgene carrying an inverted repeat in order to generate siRNAs targeting the POGO region. Different lines were cultivated at 22˚C and different lines produced seeds with different levels of dormancy. Lines producing seeds with low dormancy levels had CHH methylation levels in thePOGO region and ALN expression levels similar to those of WT plants (New Figure 4D). In contrast, in lines producing seeds with high dormancy levels CHH methylation levels were markedly increased relative to those in WT plants and ALN expression was suppressed (New Figure 4D). There results support the model that the POGO region is important to suppress ALN expression and promote dormancy. We generated aln/drm1/drm2 and aln/drm1/drm2/cmt3 mutants. Seeds produced at 10˚C from aln/drm1/drm2 and aln/drm1/drm2/cmt3 mutants had high dormancy levels similar to WT seeds (New Figure 4C). These observations suggest that high ALN expression in drm mutants contributes to their lower seed dormancy levels. Our imprinting model points to the role played by the 5’ flanking region spanning about 300bp containing the AthPOGON1 TE element (referred as “POGO region” in the text and delineated by a red bar in Figure 1B and below). According to data published by Park et al., 2016, the POGO region has low methylation levels in the central cell independently of DME. These data are now shown in Figure 1F. You are therefore probably referring to the hypermethylated region covering At4G04957 and indicated with a black asterisk in Author response image 4. This region and the TTS-spanning repetitive region in the 3’ part of ALN are hypermethylated in seedlings (see also above). In met1 mutant seedlings these regions become hypomethylated. Yet, ALN expression is similar in both WT and met1 seedlings (see above). In the “standard model” describing the establishment of imprinting through the activity of DME in the central cell, imprinting genes are normally silenced by DNA methylation in seedlings (through CG methylation imposed by MET1). Thus, imprinting of ALN escapes the “standard model” in at least three counts: 1) It is a gene that is expressed seedlings; (2) Its expression in seedlings is not affected in met1 mutants; (3) ALN imprinting persists in hybrid seeds using met1 as a pollen donor (Figure 1A). Therefore we see no particular reason to include DME in the model. Indeed, we previously showed that seed dormancy levels can be regulated by maternal ALN allele expression notably by showing that aln x WT hybrid F1 seeds obtained after pollinating aln plants with WT pollen have higher dormancy than WT seeds. In the revised manuscript we pollinated aln mutant plants with WT and nrpe1 pollen. Dormancy levels in aln x nrpe1 hybrid F1 seeds were lower relative to aln x WT hybrid seeds, further indicating that maternal regulation of seed dormancy requires suppression of ALN paternal allele by RdDM (Figure 1—figure supplement 1C). We did not cross aln with nrpe1/+. Our data suggest paternal CHH methylation is established in male germ linage, however we still do not know whether it happens before or after meiosis. If CHH methylation is established before meiosis, we would not see the difference between two population (nrpe1/+ and +/+). In this study, it is not the main purpose to clarify exactly when CHH methylation is established. We apologize for the omission to mention the statistical-related information. This information now appears in the figure legends and in the Materials and methods section. We apologize for the lack of precision. We sought to identify at which developmental stage the cold-induced non-canonical RdDM in the POGO region takes place (thereafter “cold-induced methylation”). First, we could not detect cold-induced methylation in whole flower tissues. This suggests that the cold-induced methylation that we detect in endosperm and embryos is only taking place in gamete precursor cells (thus evading detection when analyzing methylation in DNA extracted from whole flower tissues) or only in fertilization tissues or both. Consistent with this notion, publicly available data together with our AGO6-GFP accumulation data (Figure 3A) as well as our AGO6 mRNA expression data (Figure 3B) show that at 10˚C before fertilization, AGO6 expression and AGO6 accumulation is mainly detected in subparts of the flower: stamens and ovules. After fertilization, AGO6 expression and AGO6 accumulation is localized in developing seeds although our data do not specify exactly where in developing seeds is the AGO6-GFP accumulation and AGO6 expression to be found. Given that AGO6 is genetically required for cold-induced methylation in the endosperm and embryo, we conclude that cold-induced methylation results from cold-dependent activation of non-canonical RDR6-RdDM in gametes or fertilization tissues or both (Figure 4—figure supplement 3). We have rewritten the part of the text (main text and model legend) describing these points to hopefully make it clearer (subsection “Cold-dependent and tissue-specific stimulation of AGO6 expression likely drives cold-induced methylation of the POGO region in seeds”, last paragraph). We are especially grateful to Keith Slotkin and Olivier Voinnet for generously sharing seed material. We thank Atsushi Sakamoto for providing the 35S::ALN plasmid. We thank Olivier Voinnet for helpful discussions. We thank all members of the LLM laboratory for discussions. This work was supported by grants from the Swiss National Science Foundation and by the State of Geneva. © 2019, Iwasaki et al. Mature seed dormancy is a vital plant trait that prevents germination out of season. In Arabidopsis, the trait can be maternally regulated but the underlying mechanisms sustaining this regulation, its general occurrence and its biological significance among accessions are poorly understood. Upon seed imbibition, the endosperm is essential to repress the germination of dormant seeds. Investigation of genomic imprinting in the mature seed endosperm led us to identify a novel set of imprinted genes that are expressed upon seed imbibition. Remarkably, programs of imprinted gene expression are adapted according to the dormancy status of the seed. We provide direct evidence that imprinted genes play a role in regulating germination processes and that preferential maternal allelic expression can implement maternal inheritance of seed dormancy levels.